TNA Impact Wrestling’s Samoa Joe’s latest title shot at the Lockdown pay-per-view in Coral Gables, Fl. is completely different from his past ones and he is confident he’ll come out on top. Joe faces TNA champion Magnus inside a steel cage at the BankUnited Center in Coral Gables, Fl. 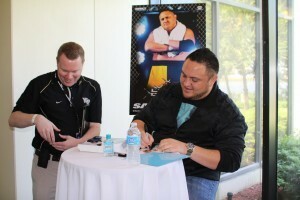 against Samoa Joe. Tickets are on sale. Doors open at 6:30 p.m. The fact that it is in a steel cage will differ this time around, Joe said. “I look forward to get in the ring with anyone,” he said. Joe also spoke about being raised in a family business of entertainment and more. Watch the complete interview. Purchase tickets now. For more on the TNA Lockdown card, click here.